Dyspnea, or shortness of breath, is common with emergency department patients. In the United States, an estimated 3.7 million patients were admitted for this condition in 2011, according to statistics from the National Center for Health Statistics of the U.S. Centers for Disease Control and Prevention. Dyspnea may be indicative of a variety of thoracic diseases including pneumonia, congestive heart failure, myocardial infarction, pulmonary embolism, COPD, asthma. It also may be indicative of pleural effusion. Ultrasound examination can provide a rapid, available, low cost imaging tool for the diagnosis of a variety of thoracic diseases. Radiologists and emergency physicians from Maimonides Medical Center in Brooklyn, NY, have identified a new sonographic marker – extension of the thoracic spine sign – that they describe as a promising tool to diagnose pleural effusion. They conducted a prospective study to determine the sensitivity and specificity of this indicator, the findings of which were published online August 12, 2015 in the Journal of Ultrasound in Medicine. A CT is considered the gold standard for the diagnosis of pleural effusion. But it is an expensive examination exposing patients to high radiation doses. Examination by ultrasound offers the benefits of being low cost, readily available, and not using radiation. Chest sonographic exams are well proven as having high sensitivity (83.6% to 100%) and specificity (93% to 100%) with respect to the diagnosis of pleural effusion. However, technical issues can lead to suboptimal sonogram quality, according to lead author and emergency physician Eitan Dickman, M.D., and colleagues. Pointing out that the “sinusoid sign” has been used to assess for pleural effusion, they noted that an additional sonographic marker that could increase overall diagnostic accuracy would be highly useful. The patient cohort the authors evaluated represented 41 patients admitted to the emergency department of the Maimonides Medical Center with symptoms of dyspnea. All patients had a CT examination of the abdomen and/or chest. If one of the three sonographers participating in the study were on duty, a chest ultrasound examination was performed. They explained their technique: “Patients were supine with the head of the stretcher elevated to approximately 45°. Coronal images of both the left and right lung bases were obtained by placing the transducer in the patient’s midaxillary line with the probe marker pointing cephalad. 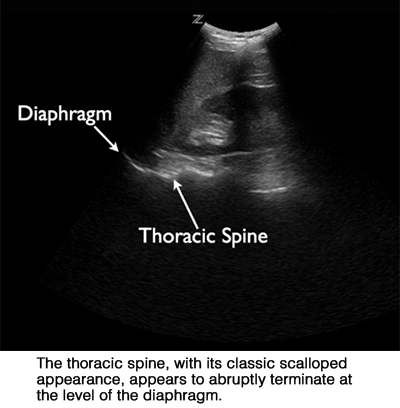 The diagram as well as the thoracic spine inferior to the diaphragm were used as sonographic landmarks.” Sonographers attempted to determine the presence or absence of an anechoic fluid collection and extension of the thoracic spine superior to the diaphragm. They also were asked to record if there were any specific impediments in obtaining an image of each lung base. The examinations averaged three minutes in duration. A total of 75 hemithoraces were included in the final analysis. Of this patient group, 25% had been diagnosed with pleural effusion based on the CT findings. There were a total of two large pleural effusions, 12 small pleural effusions, and five trace pleural effusions. The authors reported that the sensitivity for extension of the thoracic spine was 73.7% and specificity 92.9%. Extension of the thoracic spine detected seven of nine pleural effusions on the left side and seven of ten pleural effusions on the right side. In six hemithoraces in which images deemed to be suboptimal were obtained, CT findings confirmed that extension of the thoracic spine was correct. Because of this, Dr. Dickman and colleagues suggest that the extension of the thoracic spine marker may be useful to diagnose patients who have “sonographically challenging” body habitus. “Rapid identification of thoracic disease may have an impact on the time to diagnosis and initiation of treatment with patients presenting with dyspnea. Extension of the thoracic spine can be quickly and easily visualized when evaluating a patient with suspicion of thoracic disease. If the presence of an anechoic fluid collection is not clear, evaluating for extension of the thoracic spine may help confirm or exclude the presence of pleural fluid,” they concluded. Dickman E, Terentiev V, Likeourezos A, et al. Extension of the Thoracic Spine Sign: A New Sonographic Marker of Pleural Effusion. J Ultrasound Med. Published online August 12, 2015. 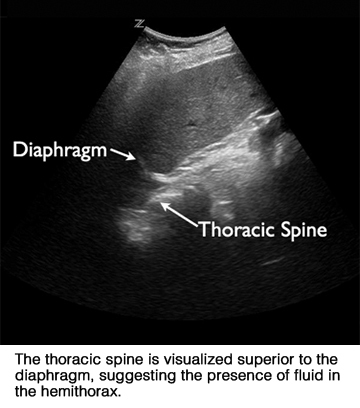 Extension of thoracic spine sign: a sonographic marker of pleural effusion. Appl Radiol.